"The movement of the train rocked me like a lullaby. I closed my eyes to the dusty countryside and imagined the sign I'd seen only in Gideon's stories: Manifest - A town with a rich past and a bright future." Having heard stories about Manifest, Abilene is disappointed to find that it's just a dried-up, worn-out old town. But her disappointment quickly turns to excitement when she discovers a hidden cigar box full of mementos, including some old letters that mention a spy known as the Rattler. These mysterious letters send Abilene and her new friends, Lettie and Ruthanne, on an honest-to-goodness spy hunt, even though they are warned to "Leave Well Enough Alone". Abilene throws all caution aside when she heads down the mysterious Path to Perdition to pay a debt to the reclusive Miss Sadie, a diviner who only tells stories from the past. It seems that Manifest's history is full of colorful and shadowy characters - and long-held secrets. The more Abilene hears, the more determined she is to learn just what role her father played in that history. And as Manifest's secrets are laid bare one by one, Abilene begins to weave her own story into the fabric of the town. This audiobook is listed as a young reader book, but I beg to differ. It's a wonderful book. Period. It's historical fiction covering the first world war and a time in America's history when immigrants flooded into our country from many other nations abroad. It's a story of the "orphan" trains, and the good and not-so-good people who adopted the children. And most of all it's a tale of one town and one little girl, Abilene that will nestle down deep into your soul and "sit a spell". This book is a jewel. Don't pass it up. I loved this book! Not only did it hold my interest, but it wove two stories into one in such a way that neither could exist without the other. I could hear the sounds and smell the aromas described in the book. The imagery was well done and so was the character development. The fact that the audio book used multiple readers to tell the story really added to it as well. While it's won awards for juvenile fiction, the story of longing and love is appropriate for any aged reader. I have read Water for Elephants, The Help, and the Secret Life of Bees and many similarly good books and I enjoyed this book equally as much! Do yourself a favor---step back in time and enjoy getting to know Abilene, Jinx and Miss Shady. 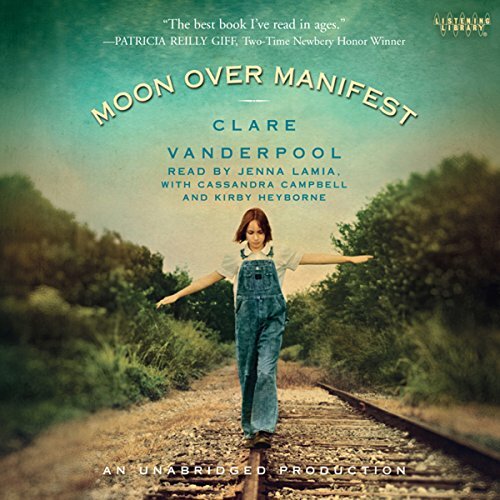 Moon Over Manifest is a fabulous book! Abilene Tucker is a motherless child (well it is a Newbery winner and I think this is a requirement) her daddy has sent her to Manifest, Kansas where he used to live there she meets some great characters and sets out to find out more about her father as a young man. This book goes back and forth between Abilene’s story during the depression in 1936 and the story of a young man named Jinx and his best friend Ned in 1918. This was a good coming of age story filled with quirky characters, and a bit of mystery and it gives you a feel of the times both stories are set in. I fell in love with Abilene and Jinx I ended up rooting for them both in their different time lines, the stories melded together very nicely. This was an uplifting story and has a feel good ending. I highly recommend this to the young and old alike it’s highly entertaining historical fiction for all ages. All the narrators did a great job but with this group of people how could you go wrong! Great YA fiction that grown ups will also love. As an English teacher in High School, I am always looking for books that my students will enjoy. That being the case, I have listened to and read a great deal of Young Adult fiction, and have found that there are a few basic plot lines that most YA fiction novels follow. This book is one of the few that really breaks the mold. It was rich, entertaining, life-affirming, and very well performed. The story follows a young girl who is looking for her own place in the world. Along the way, she discovers the history of the town of Manifest, her father's history, and a rich cast of characters. Although the story follows a teenage girl, it has murder, bootlegging, spies and mystery and my male students liked it just as much as the girls did. I highly recommend this story, either as a novel or as an audio book for teens and adults. I thoroughly enjoyed this book. A great story of a young lady who learns the history of a town and by doing so learns a personal history. I love the narration of Jenna Lamia, and I can believe that she really is the young character! What did you love best about Moon Over Manifest? The characters were SO rich, and the narrator was perfection. She gave the lead character such life and depth and pathos that I felt like I knew her and just wanted her to find happiness and her place in the world. What other book might you compare Moon Over Manifest to and why? It reminded me a little of Saving CeeCee Hunnicut, another terrific read by the same narrator. Great, strong, realistic young girls who have to get through very tough times as they come of age. This story is definitely worth an audiobook credit! Goodness I loved this book! I was on the fence for a while because it is sort of written to young adults but the story is so great. Don't pass it up. This book was selected for the literature portion of a parochial school academic decathalon among Los Angeles area schools to be held in March 2012. As grandparents. we listened to it with a sense of participation and interest that was fully gratified. We found it a very good story, well suited to a teenage audience, and worthy of its selection. Beside the fact that Jenna Lamia is my very favorite narrator, this was a wonderful listen. The switching back and forth between time periods, took a little getting used to, but it was worth it for the richness of the story. I rarely leave a written comment, but this book is so very deserving. The reader is amazing and able to carry you on a journey I didn't want to stop. A movie from this tale would be wonderful. This is my best book of 2017...I have over a thousand books in my library and I put this in the top ten. I enjoyed it fully, and hope that you will as well. Loved this experience, I feel as if I know the characters myself.